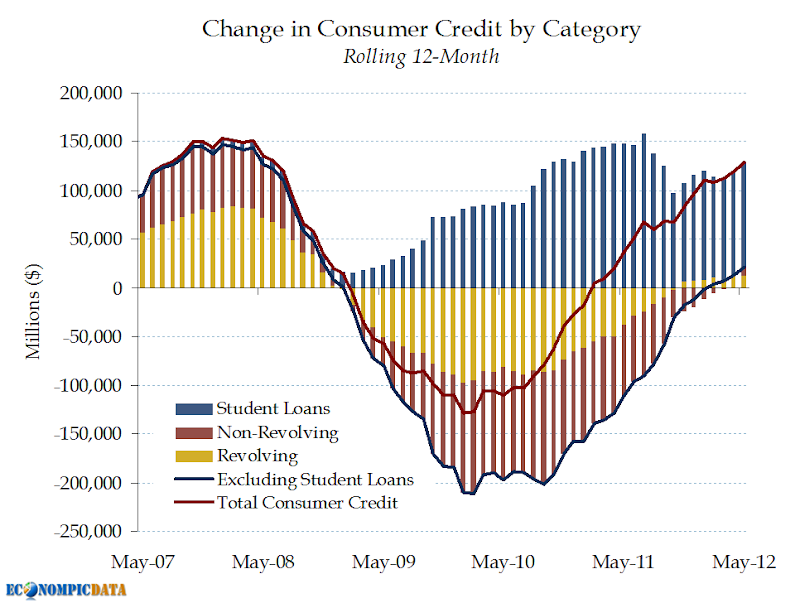 EconomPic: Consumer Credit Jumps... a Good Thing? Consumer Credit Jumps... a Good Thing? Consumer credit climbed more than forecast in May, led by the biggest jump in credit-card debt in almost five years that may signal Americans are struggling to make ends meet. The $17.1 billion increase, exceeding the highest estimate of economists surveyed by Bloomberg News and the largest this year, followed a $9.95 billion gain the previous month that was more than previously estimated, the Federal Reserve said today in Washington. Revolving credit, which includes credit card spending, rose by $8 billion, the most since November 2007. In a "normal" mean-reverting downturn, an increase in consumer borrowing is a good sign as it allows a consumer to maintain their purchase level (even without the current income to pay for it), with the expectation that they can cover their borrowing when their wages "revert" higher in the future. “When the economy’s not doing well, that’s when you want the consumer to spend, and if it means borrowing to do that, then that certainly would be encouraged,” said Millan Mulraine, a senior U.S. strategist at TD Securities in New York, who projected credit would rise by $15 billion. A pickup in borrowing coincides with a slowdown in hiring and declines in consumer confidence that indicate the job market is failing to spur enough gains in wages to cover expenses. Employers added fewer workers to payrolls than forecast in June while the jobless rate stayed at 8.2 percent. Regardless, overall nominal debt (even excluding student loans) is once again rising. A bullish sign for the short run. Mixed (in my opinion) for the longer run. Wouldn't the sales of used cars vs new cars help to show if people are struggling rather than ramping up spending in expectation of better times? I'd be interested in seeing not only used vs. new cars, but how consumers are paying for each. Student Loans should be commentated in AMERICAN DREAM category not in else. in US,if your parents were poor ,you were more likely to be poor compared to other countries.The eligible student from a poor people has roughly the same chance of graduating from college as the worst student from a wealthy people.